So easy to use, clean up and store. I bought this for my daughter and husband to use in their recent bathroom renovation. Wish I would have had this years ago as I always had to use a ladder for painting projects and fighting with the paint tray and paint cans was a struggle. Super tool! I love this product. I bought it to paint the stairway in my house. It's hard enough climbing the ladder but carrying the standard paint tray, then attaching it to the ladder shelf without spilling paint all over was impossible. This product made it so much easier and neater to finish the job and the number of trips up and down the ladder had to have been cut in half. I am completely repainting my home that this is a 'go-to item'. When doing trim work it saves the need to constantly refill a tray...AND no worrying that you might spill. Takes a little extra 'elbow grease' to clean, but worth it. I've tried lots of paint gadgets...who hasn't, painting is a pain. This is the first that really delivers and makes the chore a LOT easier. Using it is a breeze. Does exactly what it's supposed to do and virtually eliminates drips stemming from can lips or spills from trying to handhold a paint tray. Going up and down ladders? A cinch. What surprised me the most was how easily it cleans up. 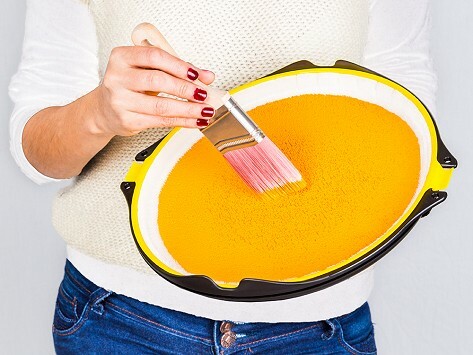 The little squeegee provided is so well designed it fits every angle of the tray to help get excess paint back in the can, minimize waste and greatly speed up cleaning. If you are a painter you simply need this. $20 well spent. Such a great idea!! Wish I'd had it when I dumped a can of paint by accident in the bathroom sink! Love the no mess and easy clean up!! Oh, and of course, the no spill feature! I purchased two nonspill paint trays for my son and daughter-in-law who are refurbishing a house thy recently acquired. They were very excited when they saw their gift; however, they have not tried them yet . I will definitely write their review once they have a chance to use them. I have not used this yet and don't know when I will but it is made well and looks very easy to use. Glad I purchased it. Want to unleash your inner DaVinci and paint upside down? Paint2It is an anti-gravity paint tray that takes the mess and stress out of painting. The tray’s unique bristle-fiber fabric holds onto paint and it stays put—even when you turn the tray upside down. No drips, no spills. Hold the high-quality disc in your hand like a palette that’s easy to bring around the room and up (and down) a ladder. Commercial painter Ben Mayberry was always thinking about how he could decrease waste (of paint, time, and money) while increasing quality. In 2004, he created the first prototype of Paint2It, and has been improving it ever since. 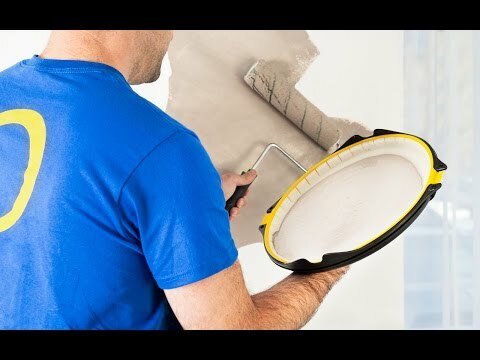 Paint2It removes the need to carry a paint can everywhere—it holds 12 ounces of latex paint, and can even hold different colors without them mixing together. Paint loads onto brushes and rollers quickly and evenly, eliminating the need to wipe paint off. It goes on the wall, not on the floor. Drop cloths and prep work are kept to a minimum. Plus, Paint2It is easy to clean with the included squeegee, which takes the paint out of the fibers so you can put it back in the can.